The best cost-benefit, compact for manufacturing of shirt-type bags and disposal bags. Since 2001 manufacturing the best machines of plastic bags in the market. We are located in Agudos, countryside of São Paulo, in our own headquarters, specialized in the manufacturing of machines for plastic bags and plastic sacks in general, with more than 25 years of experience in the field, keeping and creating more than 200 medium and heavy-duty machines, we supply to the main manufacturers of packaging in the country, Boy Service Máquinas has begun in 2001 when two forces combined to offer quality technical assistance and retrofitting service in cutting and soldering machines, always aware about the market’s evolution and prioritizing quality and dynamism; and in 2009 released its first machine upon the request of client Plástico Fabia. Ever since, the focus of the company has started to change, and then in 2011, another two forces with an experience of more than 25 years in the segment and focus on Creativity and Management of Projects united with G4 Máquinas being formed, extracting a fantastic Synergy. Can be configured with several optional resources for the manufacturing of several types of packaging. Our post-sales service is considered the best in the market, offering technical assistance with ready supply and quality. Every line of machines and equipment can be acquired through the facilitations for financing on BNDES. Accessory used for simultaneously cutting and soldering the film, separating the plastic film coil into several lanes. Developed to grant an appearance of micro points (micro holes) on the bag. Accessory used on machines for cutting and soldering G4 to bend the material into 2, 3 or 4 parts for packaging of the type “star bottom”. Designed to cut handles of several models and measures with adjustment of the knives and positioning of the bags at the time of cutting. 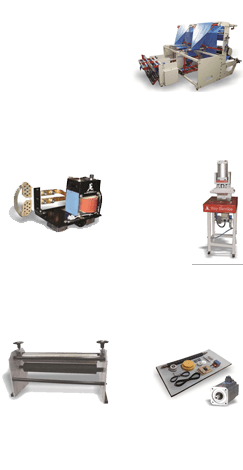 Great stock for machines of cutting and soldering, in addition to offering specialized services with qualified professionals that are always updated. The newest technology in bag making machines with trapezoidal form (conical) for flowers and greenery with or without printing, controlled by PLC and servomotor, triggering of the main heads by motor SEW and IHM colored touch screen. 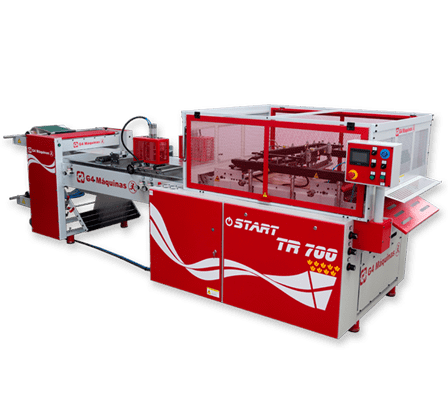 The TR 700, besides other accessories, has as an optional resource the installation of superior and inferior heads to make block bottom welded packaging, becoming a very versatile machine with high efficiency. G4 Máquinas has representatives across the entire Latin.